St Mary’s Priory Church and Tithe Barn are both proud of their collection of art, not least the 15th Century wooden carving of the Jesse Tree, the famous Abergavenny Tapestry and the beautiful wall hangings made by parishioner Elizabeth Brown. Recent additions have included the mosaics in the Foodhall representing Benedictine hospitality and the mosaic of St Benedict painstakingly made from crushed eggshells. 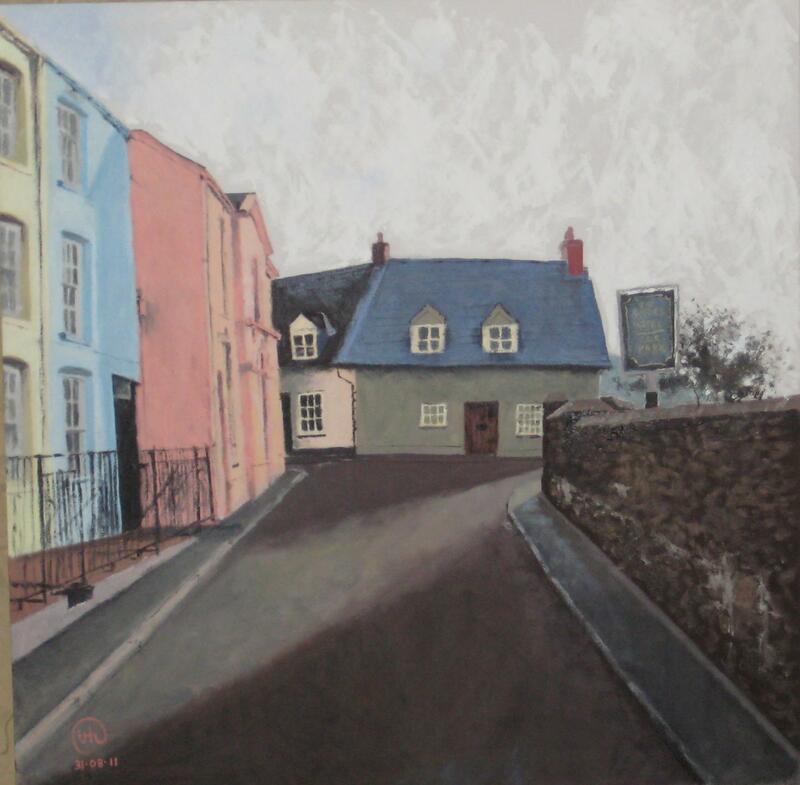 However, we are pleased to have on display paintings by local artist, Ieuan Hatherall. Ieuan has recently completed is A-levels at King Henry VIII School in Abergavenny and obtained an A* in Art. He is now studying for a foundation diploma in art and design at Hereford College of Art. Most of Ieuan’s painting focus on local landscapes, including Cross Street looking towards the Town Hall or the monument and Baptist Chapel on Frogmore Street. Ieuan says “Having the blessing of being born in the wonderful market town of Abergavenny and surrounded by beautiful mountains and architecture, my abilities to draw and paint were acknowledged first at nursery school and a self portrait being considered of GCSE standard at Infant School. If you would like to see Ieuan’s work, please visit the Tithe Barn, Abergavenny, between 9am and 4pm Monday to Saturday. Admission is free but donations are welcome to support the upkeep of this historic building. The small gift shop in the Tithe Barn sells a number of locally sourced gift items including Holy Socks, hand made soaps from Sugarloaf Soaps and hand crafted bread and cheese boards from Naturally Created. We are always looking for new gift ideas and recently one of our Learning Service volunteers, Majel Lee, discovered a craftsman from Peterchurch, Hereford, who makes small wooden gift items, including hand crosses. The hand cross has been shaped to feel comfortable when cradled in the palm of your hand. The bare wood, a true reminder of the harsh wood of the cross of Jesus, has been polished to make a very tactile hand cross that can be held in silent prayer; maybe you have no words to say and it is through your sense of touch that you are expressing your your personal prayers. As well as crosses, Bob has also supplied us with captive ring keyrings. The keyrings, turned from a single piece of timber, incorporate three wooden rings known as ‘captive rings’. Captive rings were traditionally used by Welsh wood turners to signify their affection for young maidens with the number of rings indicating the depth of their love; engagement, marriage and eternity. Both of these beautifully crafted items are available from the Tithe Barn gift shop. Over the last couple of weeks we have had a number of visitors asking for messages and prayers to be passed on to Fr Jeremy who is convalescing at the University Hospital of Wales, Cardiff. If you would like to send your own personal message, please fill in the form below. In the meantime, please continue to uphold the Dean of Monmouth and former Vicar of Abergavenny in your prayers. For the very latest update, please ‘follow’ the St Mary’s Priory blog. Staff and volunteers at the Tithe Barn, Abergavenny, send their best wishes to former Vicar of Abergavenny and Dean of Monmouth, Fr Jeremy Winston. Fr Jeremy, who served as vicar of St Mary’s Priory Abergavenny for 18 years before moving to Newport Cathedral as Dean of Monmouth, was admitted to the Royal Gwent Hospital just over a week ago before being transferred to the University Hospital of Wales, Cardiff for further investigations. Churches across the diocese remembered him in their prayers on Sunday and a special prayer vigil was held in Newport Cathedral on Friday evening. Fr Jeremy is said to be comfortable and being well cared for by the hospital staff, but it has been requested that he should not receive any visitors at this time. 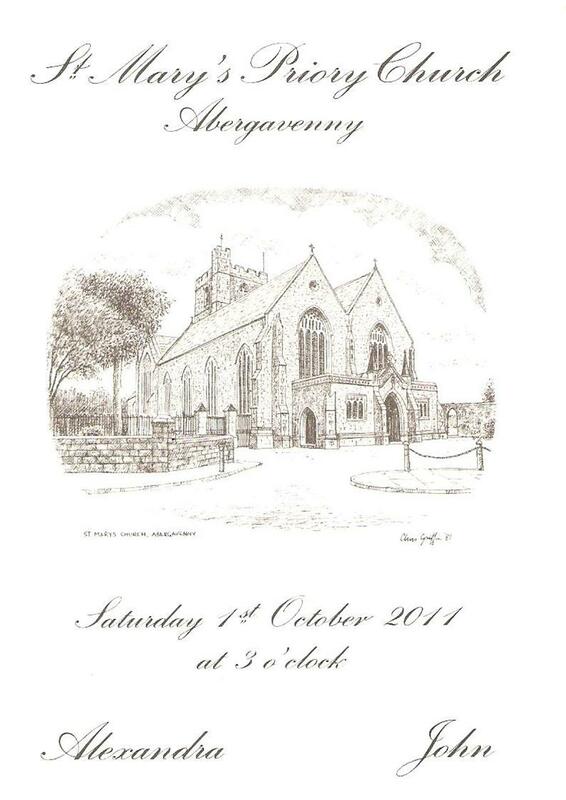 During his time at Abergavenny, Fr Jeremy was instrumental in developing the community at St Mary’s Priory and central to this was the refurbishment of the Tithe Barn and building of the Priory Centre. For the very latest information about Fr Jeremy’s progress, please visit the St Mary’s Priory blog. You can also leave a personal message for Fr Jeremy by completing the form. 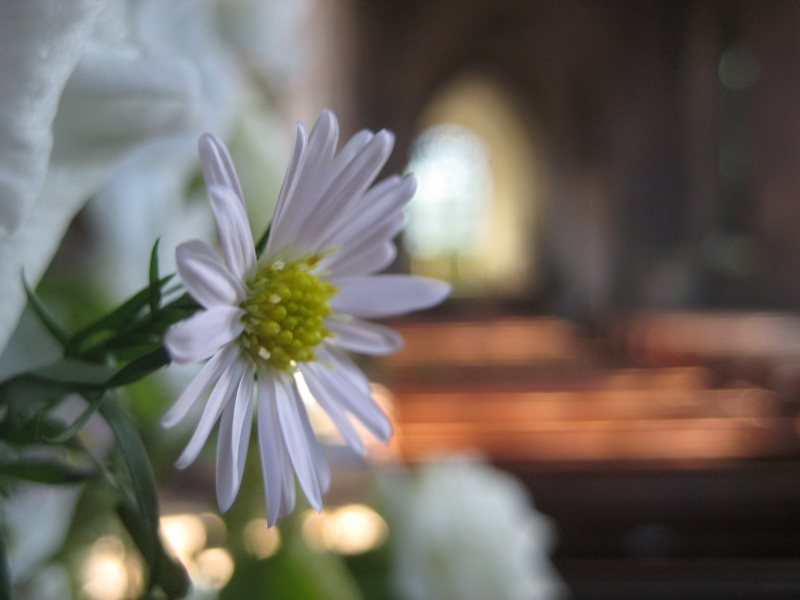 In the meantime, the staff and volunteers at the Tithe Barn will continue to uphold him in their thoughts and prayers. 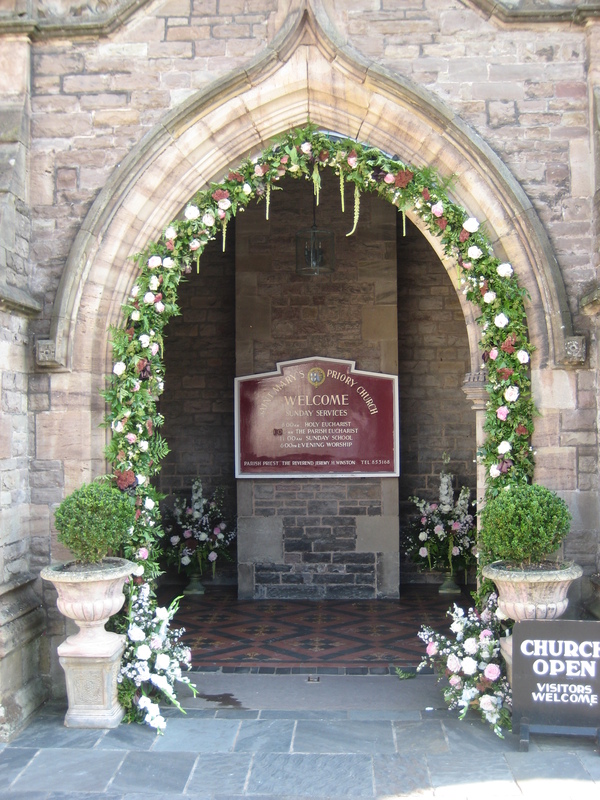 Visitors to the Tithe Barn in Abergavenny could not have failed to have seen the wonderful floral displays outside St Mary’s Priory over the last few days. 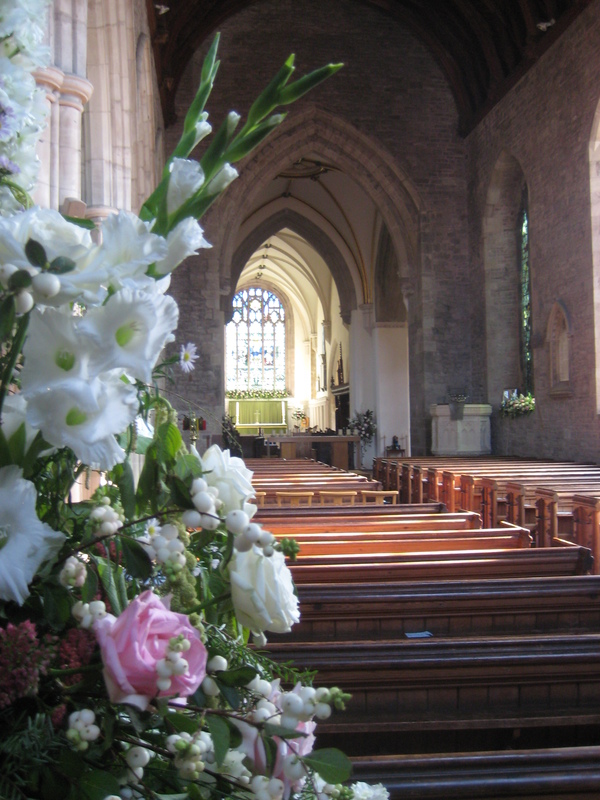 Inside the Church, the decorations were equally splendid with roses adorning the high altar, window sills and pillars. In fact, I did not dare to stand still for too long in case I ended up with a bouquet around me! The flowers were just part of the wonderful preparations for the marriage of Alexandra Boyd-Carpenter, daughter of Sir Henry and Lady Boyd-Carpenter of Llanvapley, and John Murphy, second son of Major and Mrs Richard Murphy of Swinburne which took place on Saturday 1st October. The marriage service was conducted by the Reverend Dr Bernard Sixtus who was assisted by The Reverend Dom Edward Corbould OSB, Ampleforth Abbey, the Bishop of Monmouth and the Reverend Dom Thomas Regan OSB. The Dean of Monmouth and former Vicar of St Mary’s Priory Church, the Very Reverend Jeremy Winston, was unfortunately unable to attend owing to illness. O LORD God of our fathers, giver of life and love, give Thy blessing to those whom Thou has drawn together in love; surround them with Thy protecting care; build Thou for them their home; make it to be the abode of light and love. May all that is pure, tender, and true, grow up under its shelter; may all that hinders godly union and concord be driven far from it. Make it the centre of fresh, sweet and holy influence. Give them wisdom for life, and discretion in the guidance of their affairs. Let Thy Fatherly hand ever be over them and theirs, and grant them to inherit Thine everlasting Kingdom; through Jesus Christ our Lord. Congratulations and every blessing to Alexandra and John from all the staff at the Tithe Barn.